Struggling with Anxiety, Panic Attacks or Depression? Would You like Help to Learn How to Manage Your Emotions More Effectively? Please feel free to email me to schedule Online Mindfulness-based psychotherapy with me. During these online therapy sessions I will teach you how to apply mindfulness for promoting recovery from all forms of anxiety disorders, including Generalized Anxiety Disorder and Social Anxiety Disorder, OCD, depression and other forms of emotional suffering using the well-tested methods of Mindfulness Therapy. This approach is particularly effective and most people see noticeable changes after 3-4 Skype sessions with me. Online Mindfulness-based Skype Therapy is highly effective for stopping anxiety and depression without the need for drugs. It is always better to treat the cause of your psychological suffering as opposed to just trying to manage symptoms. The main healing factors developed during Mindfulness Therapy are Conscious Awareness, which is essential for neutralizing the psychological habits that cause emotional pain, and Inner Compassion, which is what allows healing and resolution of anxiety and depression. Are you looking for the convenience of an Online Counseling Therapy Service? Do you wish to talk to an Online Therapist? Watch this video and then contact me to schedule a session via Skype. Welcome! My name is Peter Strong and I am a professional Online Psychotherapist. I provide an Online Counseling Service and an Online Therapy Service to people seeking help for emotional problems throughout the United States and Canada, and also abroad in the UK and Europe. The style of therapy that I offer online is called Mindfulness Therapy, and this works particularly well for anxiety disorders, including agoraphobia or social anxiety, as well as depression and emotional stress. I also provide an Online Counseling Service for Addictions and other forms of problematic emotional habits that you may be struggling with. So, I hope that you will contact me and ask your questions and let’s go ahead and schedule a Skype Therapy session. There is no charge if you do not like the Skype Therapy session, but most people are delighted by this service and they like the mindfulness therapy approach that I specialize in and find it very much more effective than many of the older styles of talking therapy. So, any case, head on over to my website and contact me. Thank you! Mindfulness Therapy teaches you how to work with difficult emotions and overcome the underlying cause of anxiety and depression, which is habitual reactive thinking based on unresolved core emotions and emotional trauma. During therapy sessions you will learn how to investigate your thoughts and emotion without becoming overwhelmed by them. You will also investigate the structure of your core emotions – the inner emotional imagery – that is really the main cause of recurring emotional suffering whether anxiety or depression. When you see this imagery you can change it, and when you change the emotional imagery the emotion changes too. This is a very important part of the Mindfulness Therapy process for healing and transforming emotional suffering and it works extremely well. I also offer Online Marriage Counseling in which you will learn how to overcome conflict and patterns of emotional reactivity that are so destructive to your personal relationships. As a Spiritual Path, Mindfulness Therapy helps us develop our True Self that lies within, but is kept prisoner by our habitual reactivity (the “Little Self”). Mindfulness practice teaches us how to be more alive, more authentic, more passionate in everything that we do and this brings greater happiness and well-being. Online Psychotherapy – Learn more about the mindfulness-based psychotherapy that I specialize in. Also abbreviated as Online Therapy. LET’S GET STARTED – PLEASE EMAIL ME NOW! Tell me about yourself. Tell me about the emotional problems you are struggling with. Ask your questions about Home-based Online Counseling. Welcome! My name is Peter Strong, and I am a professional online therapist. If you would like to talk to a therapist online, please email me. I will be happy to answer your questions, and when you feel ready, you can schedule an online therapy session with me via Skype. So, many people prefer online therapy because of it’s convenience, because you can, of course, make your therapy call from home rather than having to visit a therapist in their office. The other advantage of online therapy is that it’s generally very much less intimidating for you as the client. It feels much more comfortable, and that’s very important because it’s very essential that you feel comfortable during your therapy sessions. The style of therapy that I offer, which is called called Mindfulness Therapy, works extremely well online. That’s because it’s based on teaching you very specific practical skills for working with your emotions, whether that’s anxiety or depression or OCD or even an addiction. What I find most clients really need are practical methods of working with their emotions by themselves, between sessions, and that’s what I really teach during these online therapy sessions. The other reason why people like to talk to a therapist online is because they may want more anonymity than they can find in their local community. They don’t necessarily want to talk to a local counselor. So, greater privacy is also a component of online psychotherapy. So, if you would like to talk to a therapist online, please visit my website, CounselingTherapyOnline.com and send me an email and then we can discuss whether the online counseling route is a good choice for you and then we can schedule a session. All you need is Skype and PayPal and an internet connection and you are ready to start. It’s very easy to get started with online therapy. So, please, I look forward to hearing from you. Thank you! Today, people want to feel more in charge of their personal and emotional well-being. The classic doctor-patient relationship is not always appropriate for helping you overcome anxiety or panic attacks or fear. Not everyone wants to take medications to control their depression. In fact, it can be argued that over-prescription of antidepressants contributes to the problem by making you feel helpless and a victim of your depression. It is well-recognized that recovery from depression or anxiety or any other emotional problem depends on you changing your relationship to the problem. You have to take responsibility for changing how you feel, and over-dependence on medications can counteract this essential step for healing. For this reason, most doctors will recommend you see a counselor or therapist in addition to a prescription medication. Many studies have shown that this “combined therapy” is far more effective, not only for aiding recovery, but also for preventing relapse. You may have considered seeing a local psychotherapist, but feel a little intimidated by the process. If you are suffering from an anxiety disorder, visiting a therapist in an office setting may just not feel comfortable. If you are suffering from agoraphobia, leaving the house may simply not be an option. Many people are also looking for an alternative to traditional “talking therapies.” You may have already tried counseling, but felt that it was not helping you get to the root of the problem. I hear this very often, which was one of my motivations for developing the Mindfulness Therapy Online Counseling Service via Skype. When you work with a therapist, you should have a plan and a time frame. Overcoming anxiety disorders or depression should not take years of therapy. That simply indicates that the therapeutic modality is either very inefficient or that it is simply not suited for your needs and personality. Read what Wikipedia has to say about Online Counseling. 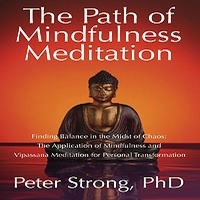 In the system of Mindfulness Therapy that I have developed, and describe in my book, “The Path of Mindfulness Meditation“, the focus is very much on helping you change the underlying causes of anxiety, depression and other forms of emotional suffering. Because we focus on the underlying process, people see big improvements in a very short time. Most people see major changes after 3-4 sessions. Some people who have been struggling for years with severe depression or panic anxiety (which is very responsive to Mindfulness Therapy) may need up to 12 sessions to see real results. But, clients rarely need to go beyond 3 months of sessions. You may also be interested in obtaining online assistance for helping you with your marriage or personal relationships. Mindfulness Therapy is a remarkably effective tool for helping you break free from negative habitual patterns of thinking that can be the source of so much conflict in a relationship. We also need to deal with unresolved core emotions that we acquire from our parents that often become activated in our personal relationships. Mindfulness is extremely good for working with emotional abuse and unresolved emotional conflict. Online Counseling is a comparatively new therapeutic service. There are many benefits over the usual in-person counseling sessions – such as the greater convenience of an online counseling service and the greater variety of therapeutic approaches available online. How does online counseling and online therapy work? The older style of online counseling therapy entails a client writing out their problem and emailing it to the online counselor, or online therapist who then responds back within a day or two. But today, the preferred method is to use Skype for real-time therapy sessions. Face-to-face counseling service may not be easily accessible in your area or perhaps the kind of counseling you are looking for is not available where you are living. Online counseling therapy and online psychotherapy give you a wide range of choices as to the type of counselor you can seek advice from. You may have been contemplating of seeking counseling service for a while, but are uncomfortable with a provider in your town. Know that counseling online is just like a face-to-face counseling, but provides greater freedom and choices. Have you considered counseling in the past, but did not feel comfortable with face-to-face sessions? Give online counseling a trial. It is generally a lot less expensive, but also offers you much greater flexibility. The greatest advantage and benefit of counseling online is convenience. Traditional therapy involves the client going to an office to meet his counselor or therapist. You may have to drive a long distance to your therapist, find a place to park, and waste time waiting for the session to begin. Online counseling erases this hassle and makes it much more likely that you will return for follow-up sessions. Online counseling takes place in the comfort of your home and at times that work for you based on your busy schedule. With the advancement in wireless technology now available, you can arrange for a session wherever you live. Online counseling services are generally much less expensive compared to the traditional, face-to-face method of counseling. Traditional counseling session can cost hundreds of dollar per hour; most online therapists charge less than $100/hr. Another advantage of online therapy is that of anonymity. Online counseling provides a much greater level of anonymity. Emotional problems are challenging for all of us and many people feel uncomfortable sharing their deepest problems with people they may know in their community so reaching out to a therapist outside of their community can feel much more comfortable. Clients who are shy, who lack confidence, as well as those who suffer from social anxiety disorder or even agoraphobia can effortlessly and comfortably access therapeutic intervention online via Skype. Many of my clients work from home via their computer so it is very easy for them to schedule an online therapy session. I also see new mothers who stay at home and could benefit from a little emotional support. Child rearing can be very challenging and postnatal depression and associated anger issues are much more common than you may think. There is a definite need for online therapists to help others cope with depression. The elderly and those with mobility issues are also attracted to online counseling as a way of getting help for emotional issues. I teach mindfulness meditation for stress relief, which is quite popular for the elderly. During these online counseling sessions I will teach you how to work with difficult emotions such as anxiety, depression and obsessive reactive thinking using the well-tested methods of Mindfulness Therapy. Please email me to learn more and to schedule an online therapy session with me using Skype. Skype counseling is a very effective alternative to conventional therapy for most people. Contact me to learn more about how counseling via Skype can help you. Online counseling sessions over the internet. Email me to find out more about therapy via Skype. I will be happy to answer your questions about psychotherapy via Skype, and when you feel ready, you can schedule Skype session with me. Welcome! My name is Peter Strong and I am a professional internet psychotherapist. I specialize in Online Mindfulness Therapy for the treatment of anxiety, depression and addictions. Now, anxiety counseling online is becoming highly popular for many reasons. Greater convenience is certainly one of those reasons, but another very important reason is, of course, because of the condition itself – anxiety. People plagued by anxiety often find it extremely difficult to go to a therapist in his or her office, in-person. So the online psychotherapy option provides a very attractive alternative for the treatment of anxiety disorders and also for other anxiety disorders such as agoraphobia and social anxiety disorder. Whatever the style of psychotherapy that you prefer, you need to work with the underlying structure of the anxiety or depression itself. Traditional Talk Therapy can be helpful, but often it does not alter the underlying structure, the underlying process that creates your anxiety and depression. The same can be said for medications – the antidepressant may relieve symptoms for awhile, but medications are not going to change the underlying psychological process that causes the anxiety or depression. So, it’s very important to seek what we can call a process-centered therapy to try and change the underlying process that creates the anxiety or depression. CBT is an example of a process-oriented therapy. Mindfulness Therapy, which is a system of work that I developed in the 1980’s incorporates CBT methodology along with mindfulness-based techniques, and this is another extremely popular process-oriented therapy for the treatment of anxiety, depression and other emotional problems. Email me to learn more about this online counseling service and to arrange for a therapy session via Skype with me. This online counseling therapy service is available world-wide, including the USA, UK and Europe. This Online Counseling Therapy Service is available wherever you live and is designed to help you better manage anxiety, depression and for help with recovery from addictions. Please contact me if you would like to schedule a Skype therapy session. Welcome! My name is Peter Strong, and I am a professional online therapist. I offer online therapy via Skype for the treatment of anxiety, depression and addictions. If you are interested in an online therapy counseling service, please visit my website, CounselingTherapyOnline.com and email me, then we can discuss setting up a Skype therapy session for you to help you with your anxiety, depression or other emotional problems. The online counseling therapy option is a very convenient option, especially if you are living abroad or if you are living in a rural area, where there may not be adequate access to a local therapist. It’s also very popular if you want to maintain more anonymity and prefer the privacy of working one-on-one with someone in another area. Another advantage of online therapy that most people notice is that it’s very much more comfortable for you as the client. It’s actually easier for you to work with emotions if you are working from the comfort of your own home. Also, of course, it’s very convenient since there is no commute involved and you can schedule a time that suits your busy schedule. The style of online therapy that I offer is called Mindfulness Therapy, and this is one of the most popular modern forms of cognitive therapy for treating anxiety, depression and for addiction counseling. In this approach, rather than just talking about your emotions, we actually investigate the structure of the underlying process that causes your anxiety or depression. We work with compulsive thoughts and reactive emotions. We work on changing the way you relate to these thoughts and emotions so that you can become more independent and become less victimized by reactive habitual thoughts and emotions. Because we work on the underlying process, you can expect to see results much quicker than you would with conventional talk therapy. This is also a very popular alternative to the medical route of prescription medications, which may help in the short term for treating symptoms, but of course, medications will not change the underlying cause, the underlying process that produces your anxiety, depression or addiction. So, if you would like to learn more about this online therapy counseling service, please CONTACT ME through my website and let’s schedule a Skype therapy session. Thank you! You can talk to an online therapist for social anxiety disorder and agoraphobia. If you would like to talk to an online therapist for depression contact me. Tell me about yourself. Tell me about the emotional problems you are struggling with. Ask your questions about Online Therapy. Let me help you. You can look for a local psychotherapist near to where you live in Colorado or other US states, but you might like to consider a better alternative: Online Therapy. It is certainly more convenient and there is no commute! Also, the choices you have locally may not be the best for you. Today, more and more people are turning to the internet to find the rich therapist to work with, and one with the right approach. Online Therapy is easy to set up. Sessions are via Skype. All you need is a computer with a webcam and you are ready to start. All sessions are individual, confidential sessions with Dr. Peter Strong, a specialist in Mindfulness Therapy, which is very effective for resolving many emotional problems. Mindfulness Therapy teaches you how to break free from those habitual reactive patterns of negative thinking and emotional suffering. Would You like to Learn More about Online Therapy in Colorado? To get started, simply email Dr. Peter Strong. Introduce Yourself. Ask your questions. Let us determine if Online Therapy is right for YOU. Read the pages on the website to learn more and schedule a session today. Payments are made through PayPal after each Skype session, and only if you are completely satisfied with the results – which you will be. In the UK and Australia, the provision of an Online Counseling Therapy Service is recommended and promoted by the national health agencies as a significant asset that ought to be made more generally accessible as a major aspect of a prevention campaign to oversee mental conditions, like anxiety, depression, etc. Online Counseling is both a very effective and extremely convenient choice for most individuals. Convenience is one of the fundamental elements – individuals are frequently too occupied, making it difficult to take the time to drive to and from a therapist’s office. It is considerably more time-efficient to just turn to your PC and make that Skype video call at the planned time. Likewise, numerous individuals, for example, moms with kids and the elderly or disabled, find it difficult to make the special plans to leave home to go to their therapist’s office. There is additionally the issue of availability. Individuals living in the country or isolated places, those living abroad in non-English speaking nations, and also those living in cities, like New York or LA where the cost of therapy service is excessively expensive for some individuals. The provision of an Online Counseling Therapy Service is also an excellent option for those individuals who are experiencing chronic anxiety and depression and who may find it too difficult to leave the security of their home to attend sessions in a therapist’s office. Anxiety and depression are common conditions that influence the majority of us some time in our life. For the majority of us, these anxiety and depression episodes go through like a rainstorm, however in the end, they resolve themselves and we go back to our normal state of balance. For some, the ways of depression and anxiety responses don’t lift so effortlessly and the same negative thought repeat over again like a broken record player. This re-experiencing and reliving emotional disturbance and pain is a significant source of anxiety and leaves us feeling depleted and unable to adapt. We get to be apathetic and feel our life vitality depleting ceaselessly. Depression and other anxiety issue have an internal structure as constant cognitive reactions to which we have gotten to be aimlessly attached through the methodology of identification. The negative thought emerges and afterward we become the thought. A stress-thought emerges and we become worried. Anger emerges and we become angry. Fear emerges and we become afraid. This process get to be happening consequently and is sustained by the way that we are unaware of the receptive process of getting to be. The thought emerges and truly seizes us and pulls us into a foreordained state of awareness against choice or will. Habitual responses thrive on our unawareness of them and will proceed uncertainly so long as we stay unaware. Welcome. My name is Peter Strong and I’m a professional psychotherapist based in Boulder Colorado. I offer online counseling chat via Skype for help with anxiety, panic attacks, depression, OCD and many other common psychological emotional problems that will benefit from mindfulness therapy, which is what I offer during these online Skype therapy chat sessions. So mindfulness therapy is a way of helping you break free from habitual reactive thinking and during these online chat sessions I will show you exactly how to apply mindfulness methods to break free from reactive thinking. So as you know, excessive reactive thinking in the form worrying, in the form of rumination and proliferation of thoughts simply feeds anxiety and depression. Many of us get trapped in this habit of proliferating negative thinking. But with mindfulness training you can break free from this habit. You can start to actually watch those thoughts without becoming swept away by them, without becoming identified with those reactive thoughts. When you do this you take the fuel away from the anxiety or depression and it is allowed to continue its natural path of resolution and healing. If you stop feeding the fire of anxiety or depression then that fire will burn itself out. This is one of the central principles of mindfulness therapy and training. If you stop feeding anxiety and depression through identification with reactive thoughts then the you are taking the fuel away from those emotional states and they will subside and change. Also, when you break free from the habit of reactive thinking you open a space of conscious awareness in the mind where you are more able to see other options, other thoughts that are more positive solutions to the situation, to the objective difficulties that you are facing. It becomes a lot easier to solve problems externally once you break free from the habit of reactive thinking. If you would like to learn more about online chat with me as a therapist then please go to my website and read more about this online therapy service. Send me an email, ask any questions you may have, and lets schedule a trial Skype therapy session. We can work on helping you break free from anxiety or depression.